We were still on our UK trip over the New Year period. It was very mild and settled weather both on the south coast of England there and back here in Ireland. 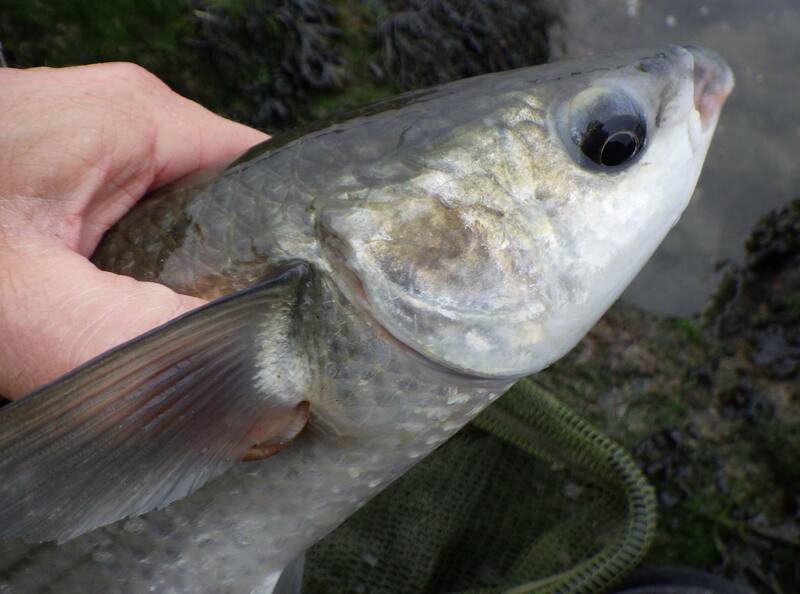 I just knew the mullet would be out in force at home, so it was no great surprise to see my Facebook friend Jason's post on New Year's Day - he'd caught ten mullet at Rosscarbery including a specimen 5:08! It was the 6th before I could get down there, on a still but slightly chillier morning than of late. There were plenty of mullet showing, mostly well out but some closer in, especially in front of the grass area. 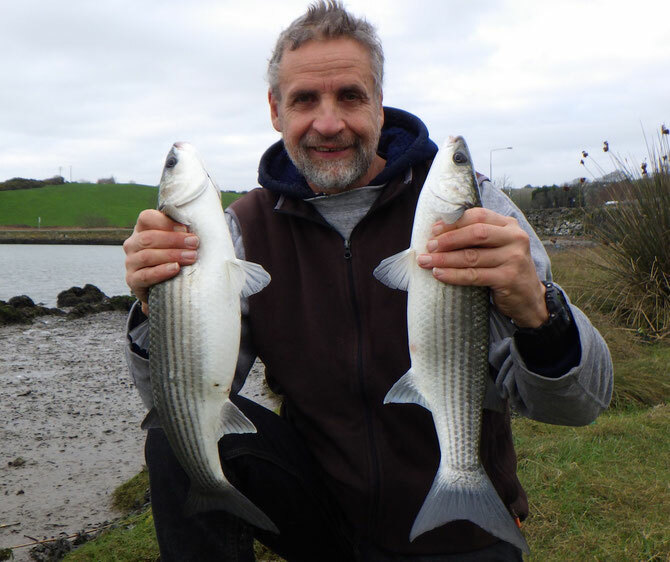 I was soon set up and fishing but despite having fish all around my baits, my tips remained motionless apart from an occasional little nod when a mullet swam over one of my lines. After a frustrating couple of hours, my right hand tip pulled round then dropped back, and the line fell slack. I struck and was into a decent mullet that ran well out and then over to the right. 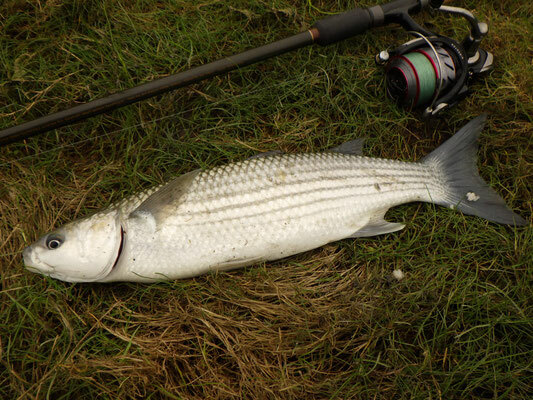 I slackened off the drag of my left hand rod then followed the fish over and eventually beached it after a good scrap. I lifted the mullet up then walked back to base, only to find the other rod bent round fiercely to the left and line streaming off the spool of the reel. I quickly put the first fish in my landing net in the shallows, grabbed the second rod, sorted out the drag then played in my second mullet of the day, a smaller fish than the first. I discovered the battery in my scales was dead so I left both mullet in the net while I did a quick dash up to the village to buy another. The fish weighed 4lb 1oz and 2lb 4oz. Then, a good pull round on my left tip ... 2lb 5oz ... and ten minutes later I struck at a rattly bite ... 2lb 1oz. After that, everything went quiet in my swim but I could see Jason into a fish from the wall - it looked a good scrap and a decent fish as he eventually hoisted it up in his net. I gave it another hour then decided to pack up. I loaded my kit into the car then went for a chat with Jason. His fish was 5:07, his second specimen of the year already, and while I was there he had another 3lbs-odd.